Emily taking in the sun on her final day with us. Beautiful as ever. My heart and soul. With a very heavy heart, this isn’t the next blog I had in mind when writing a series about cancer. 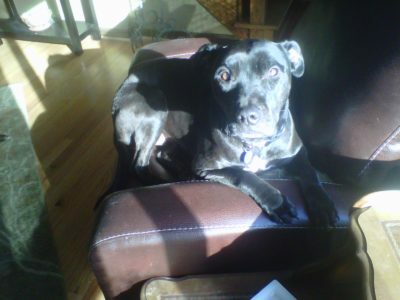 The write up on diet is almost done, but instead, I write about not only the inevitable of losing your pet, I write about losing my own beloved Emily, my pit pull, my only “foster fail”, my heart, my family member. 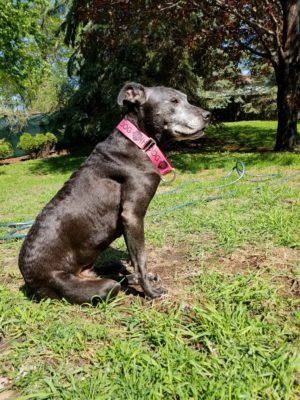 I had an order and thoughts on what I felt was most important for you to read about when you first get a cancer diagnosis for your dog. I planned to write about the different things you could do – things you could start immediately, write about the emotional support you have available, the resources in the community, but instead today, I am writing about the losing your pet…really, like I said, I’m writing about losing mine in hopes that it will help you. My eyes are red, itchy, sore and swollen, my head throbs, my nose raw and my body exhausted. But worst of all, I am so broken, shattered, numb…my heart literally aches in excruciating pain. My Emily gained her wings on Tuesday – my baby girl, pretty princess, sassy pants, Em, Emmy Em M, Emileee. She wasn’t just my “dog” or my “pet”, she was my family member, another living being. I love her so deeply. Saying goodbye is so difficult, painful and it is taking every ounce of strength to hold myself together and find my way through this time. Cancer is an awful disease. Emily had hemangiosarcoma – a cancer of the blood vessels. It’s extremely aggressive type of cancer with a grim outlook. She was given only 3-6 months to live post splenectomy with a disclaimer that most dogs don’t see 3 months. She had a tumor on her spleen that burst, causing internal bleeding back in December. 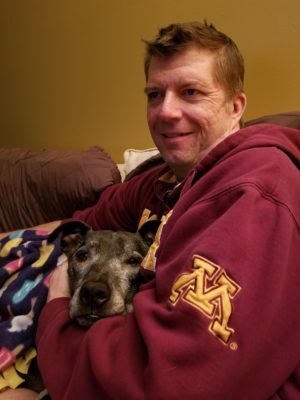 At that time, I was given the option to let her go or have a surgery to remove her spleen, giving her that extra 3 months….unless of course they found she was riddled with cancer during surgery, in which case they would recommend not bringing her back out of anesthesia. At that moment I was torn open and gutted. It came out of nowhere – she was fine, then the next moment she wasn’t and I knew something was terribly wrong. We rushed her to the ER vet. In my mind, I was hoping it was a blockage or minor stomach issue. It wasn’t. It was the “C” word…cancer, though I wouldn’t find out for another two weeks when the pathology results came back. I was in shock and not prepared to deal with my dog dying, my baby girl. She was only 10 years old. Yes, 10 is considered a senior, but she was only 50# and in otherwise great health or so I thought. Our agreement was 15 that I made with her. She was going to live until at least 15 years – that’s what I wanted anyway. We still had plans – she was going to be my Maid of Honor in just a few weeks, move into our new house together, we had more walks to go on, camping trips, she’s my main demo dog for work – I didn’t have her slated for retirement any time soon. She was my girl, my snuggle buddy, the one that despite everything in the world going on, would stare intensely at me and send all sorts of good vibes and love until you noticed her. And then through her love she would command time together, melting into me and letting go of the world. She was like no other. A true pit bull that loves her people and loves big. Cancer comes in many forms and has many outcomes. 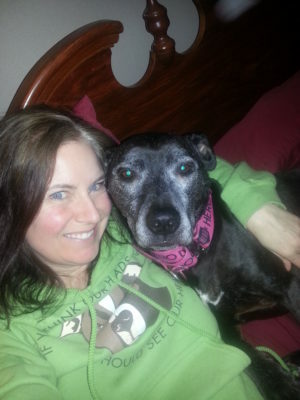 Some aggressive like Emily’s and others can go into remission and the dog live a long life. In addition to my regular vet, there are resources for learning more about cancer. There are groups on social media that are general pet cancer groups to those specific to a pet’s diagnosis. I found some helpful, especially the one about a holistic approach to hemangiosarcoma. 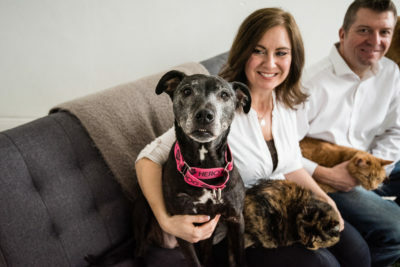 At some point, I plan to host a viewing event for the docu-series, “Truth About Pet Cancer” that I watched recently to continue to be able to educate and support those in my community. Keep an eye on my website and social media pages for more information on that. I’ll continue with the blog series about dogs with cancer as well. Planning. At this point, I’m not sure what is more painful or how I came up with the strength to plan for my dog’s death. I admittedly did not want to “plan” it. I have dealt with it before, losing my last dog, Tucker, but I didn’t schedule his time to go. He was struggling with cancer too and at about 2am he woke me to go outside and my poor baby was losing it from both ends. The struggle was long and I knew it was time – his body was rejecting everything and he was refusing to eat. I laid with him the rest of the night on the hardwood floor next to his dog bed (because he could no longer do stairs to get to the human bed) and in the morning we went to the vet office to say goodbye. It was horrible and devastating too. But I didn’t have to plan it. I didn’t have to wait days to with his death looming over me. I feared this to no end. I had been preparing myself emotionally for her leaving since December, but it didn’t make this moment any easier. I thought it might. I knew Emily’s time with us was limited and precious, as was every single day I had with her. But that didn’t make one iota of a difference when the time came that I knew I needed to make plans to help her cross the bridge. I was sick, heartbroken, uncontrollably sobbing, searching for just one more thing I could do to help her. I had switched her diet, had her seeing two holistic vets and her regular vet, she was getting regular massages and essential oil treatments from me, chiropractic adjustments and I continued to adjust her supplements based on her situation. I talked about doing acupuncture, but never got around to it. I was willing to do anything to keep her here, happy and living a quality of life. I know that all these things helped Emily and made a difference in the last almost five months together, but it couldn’t change her diagnosis and it couldn’t change that ugly truth about how aggressive the cancer was in her body. It was time and I had to do something..well, not just “something”, I had to help end her suffering, bring her peace and say goodbye. I knew this would be the most selfless act that I would ever do for her, yet the most painful because I love her so much as if she is part of me. In my soul and bonded to me in a way that perhaps only other animal people can relate. I know you are out there because I’ve helped you through this time with your own pets. So, to back up for a minute, Emily had a ‘bleed’ – a tumor had burst – and despite all the efforts, she was not recovering from it. I had the emergency red pill and Yunnan Baiyao (specific herbs to help stop bleeds), keeping her quiet and I had insurmountable love to give her. Love heals. How could she not get better with the amount of love I have for her and everything I was doing? She should have bounced back, it was only a little over 4 months. I was hoping for 8 -12 months with her despite her diagnosis. I figured with everything I’m doing and the support system I put in place for her, that surely, she would easily outlive the statistics. This vicious and unforgiving cancer had other ideas. Despite throwing everything at this awful cancer and supporting her with every ounce of my being, she was still failing. The weekend was brutal, watching her go from all tail wags, pittie smiles and a sparkle in her eye to struggling. It wasn’t just a bad moment. Emily would lose her breath after a short walk to go potty. We started carrying her in and out so it would minimize her activity. She had difficulty staying comfortable. I started her on pain meds in addition to CBD oil. Her heart rate would go from normal to erratic in a moment, panting or labored breathing. She was exhausted and she was in pain. She wanted her people and we snuggled and soothed her the best we could. Sunday night came and I could see the pain in her eyes and how stoic she was being trying to fight. She was tired, hurting and I knew she wasn’t going to get any better. We always had snuggle time every night. She used to march up the bed and right between us whether there was room or not and insisted on being right there with us, between us and touching us. Now we carried her upstairs and set her just where we knew she would want to be. She laid her head on my stomach and I stroked her softly, sent Reiki, love and healing to her and embraced our time together. Eventually, she quietly got up and slowly moved to a dog bed on the floor. We had set up a ramp on the bed to the floor that she could use. I followed her and covered her with one of her favorite blankets. Held her head and kissed her between her eyes like I always did and told her I loved her and asked her like I always did, “Do you know how much I love you? I love you so much! You’re my baby girl.” I kissed another dozen or so times and pet her, and curled up next to her for a while. Later that night I found way back to my own bed and started to sob uncontrollably. I knew at that moment what my heart was telling me. That made me sob more. I couldn’t stop. I was trying to be quiet so I didn’t wake Daniel, but I couldn’t catch my breath. I couldn’t breathe, the tears rushed out of me like raging river, my heart was pounding and in so much pain – I thought this might be what a heart attack feels like, but worse..it’s what a broken heart feels like. Daniel woke up and in a brief moment understood what was happening without any explanation needed. He wrapped his arms around me and said how sorry he was about Emily and held me and let me sob. For hours. I was paralyzed, crying, sobbing, blowing my nose, losing my breath. I felt like it was me dying. Because I knew it was time to help Emily cross over. I was going to be the one to have to make the call, to schedule a time to let her go, to watch her suffer until then. To know that I could do no more, to feel like I failed, even though I know I did everything possible to help her. It didn’t matter then, only that I had figure out how to find my way through this next part. I was booked with clients most of Monday but knew I would need to find time to schedule Emily’s appointment. I had already weighed out some of my options in months prior, knowing the time would come sooner than later and I’d likely have to make this daunting decision. Just like everyone, I was hoping that perhaps she would be curled up on my lap and peacefully take her last breath. Now, I was aware that wasn’t going to happen. I hadn’t made any concrete decisions about how this would all happen, but most of all when it came time, I didn’t want to have to schedule it. But here I was, having to schedule her death. It was a horrible, awful, feeling, yet my driving force was knowing I was doing right by her. I had to put my own grief aside and forge ahead. I was sick. Literally, my body physically ill and displaying signs of the flu – but I knew it wasn’t that. I knew that I was not designed in any part of my threads that weave me into the person I am to choose to “kill” another living being and especially not one that I love so much. This is not how life should go. But here I was, still on the same road facing the same fate, knowing that there is no other clear path. That this truly is the most compassionate thing I can do for Emily. So, with that, I got my nerve up and looked up the website of Blue Skies Pet to contact them to make arrangements for her. I chose this in-home euthanasia company because a few clients had used them and had given me really good feedback. Then I started recommending them to all my clients facing this devastating reality before me. With the way things played out, I knew I wanted to be at home, that I wanted our whole family to be there and part of the process and most of all I wanted it as easy on Emily as possible. I couldn’t bring myself to call. The tears were flowing, and I only had a few minutes between clients and I needed to figure out how to pull myself together. I still didn’t want to admit what I was doing. So, I emailed them with a brief explanation and request for availability. I really didn’t have to say the words or even type them. Still, I almost threw up. I cried some more after I hit the send button – loudly and intensely. I reminded myself that I’m doing what’s right for her. That I’ll get through this and that this will bring her peace and comfort that I can no longer provide. Ugh…still….the aching in my heart…. Sure that my eyes were red, mascara smeared (the only make up I applied that day…why I bothered, I don’t know…probably thinking it might hide the puffiness from crying all night) and nose runny. I pulled myself together best I could for my next client. Channeled my energy to focus on them and what they need. Thankfully, it was a client that was always a joy to see and in good health, one that I could get through the appointment by focusing on how much I loved their dog and how I am helping him. My plan was to keep our conversation light and directed at their needs. But, this client knew me personally and through rescue. She knew what I was going through. She saw my posts over the weekend about Emily not doing well. Of course she asked….and tears sprouted right out of my eyes like something you’d see in a fricking cartoon. I avoided eye contact and did my best to talk normally, but it squeaked and trembled instead. I gave Meatball a small hug before getting up from his massage because dog hugs help. And he let me. In our parting conversation, she said how sorry she was and reminded me to take time for myself that I needed to get through this and gave me a hug. I have the best people surrounding me. I am thankful for that. It was comforting to have someone sympathize with me. To not judge me for crying about my dog during their appointment for their dog. To know she understood. By the time the appointment finished, I had a call and follow up email from Blue Sky Pet giving me options for a time they could come over. Again with the waterworks. Again with the sickness and pain and heartache. I worked to rearrange my schedule as I didn’t want her suffering and I didn’t want to prolong it but I also wanted as much time as possible with her before she left. That might not even make sense but it did to me at the time. I was supposed to go to my wedding dress fitting Tuesday morning then shopping with my mom for flowers and decorations. Just like everything else exciting and wonderful happening in my life right now, none of it mattered. The only thing that mattered to us was our Emily and our family. I rescheduled my appointment and emailed Blue Sky Pet back to confirm a time. It was set. It was happening. I felt like I crumbled into a million pieces. That my world was ending, the lump in my throat so big I couldn’t breathe. How could this be happening? I know logically that it’s inevitable and despite how and when our animal companions leave us, it’s never easy and in the moment, it’s not clear how we will make it through, but I know that we do. I thought of all the things I tell my patients that come in to comfort them during hospice care or support care after they’ve lost their pet. I felt stupid and angry and that it was ridiculous that anything I could think of would remotely help at this moment. I was not a soothing comfort to myself. I wanted to be with Emily. I wanted to fix this and make her better and give her more life, quality life. I wanted her to be able to live long enough to be my maid of honor and share in our wedding as a family. I wanted her to get to move into our new house and enjoy the peace of the country and a huge backyard. To sunbathe and sniff for rabbits and feel the love that surrounded us. She would not get any of that. Emily was leaving us the next day. Tears flowed as I did my best to race home in rush hour. All I wanted was to be with Emily. To touch her, to tell her I love her, snuggle, let her know everything would be ok, to be there for her. I had messaged a dear friend of Emily’s before leaving, letting her know what’s to come and inviting her to spend some time with Emily. I knew her heart was tender and big and that as difficult as it was, that she would want to have one more chance to see her and spend time with Emily before she left us for a better place. And Emily loved people and was such a social butterfly, I wanted to give her all the things she would want. Kristy came over that night. We laughed, we cried, I lost my sh*t and re-composed. We honored my sweet Emily. I’m so glad she could come and I know Emily loved it. Meanwhile, Daniel went out and got her cheeseburgers and us all a feel good movie, appropriately titled: “Forever My Girl”. We moved the DVD player up to the bedroom so we could all snuggle, I made popcorn and we settled in to watch a movie. She planted herself between us, her head on my chest and her paws and hands holding each other. We sent all the love we could give her. She didn’t want any popcorn, a sign that helped me realize that I was making the right decision. Emily didn’t turn down food and definitely not popcorn. That was a ritual and a right she earned that if there was popcorn, she deserved some. My heart broke a little more even though it should have made me feel better. It’s something I filed in my brain and will hold onto for moments to come in the future when I need help overcoming the guilt, grief and emotions of losing her. Later she moved to snuggle with her brother Bodi. Their paws intertwined and they rested quietly next to each other. I wanted them to share in some time together too. They had been together for almost six years and I knew he would grieve too. 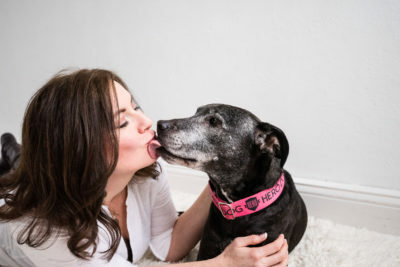 In fact, I deal with it all the time, helping my clients – both animals and humans – wade through the messy, emotional roller coaster that death brings. I should have been better prepared. It should have been easier for me. I know what to expect. I deal with hospice, death and dying almost daily…it only makes sense that I’d be better prepared, more able to handle it…well I wasn’t… not even a little bit. I was in the same boat everyone else lands in when letting go of a loved one. Shattered. The next day, I slept in and snuggled with Emily. Fed her raw beef and sneaked in another pain pill to keep her comfortable. We did our best to really embrace the moments we had with her. Daniel made arrangements to work from home and take any time he needed that day off. Her 2pm appointment loomed over us but knew that we needed to put that aside and give her everything we had to make the day beautiful and lovely for her. We took her outside to sunbathe. To sniff (she was a terrier!) and soak up what mother Earth had to offer. She watched the squirrels, took some deep breaths and found comfort and peace with us by her side. We took pictures and more pictures. We shared memories and told stories about Emily. 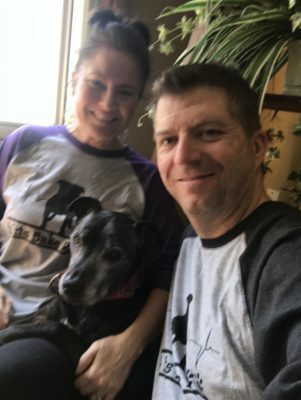 We dressed up in rescue pit bull t-shirts in her honor and took more pictures. We offered her a cheeseburger, liver and chicken hearts, but she wanted only a little piece of the cheese. I gave her more beef, which she happily ate. We snuggled and petted and kissed her and told her we loved her a million more times. While 2pm loomed, it also came quickly. Before we knew it, Dr. Becky was there to give Emily her final gift. Blue Sky did a wonderful job of being patient and compassionate, yet helping us move the process along. They explained each step and let us know what was happening and what to expect. Dr. Becky gave us time and let us be with her and near her the whole time. Our whole family was able to be part of it. My sobs and stories I shared and moments of falling apart and hugging and kissing Emily and telling her how much I loved her and that it’s all going to be ok were all accepted and welcomed. Dr. Becky quietly let us grieve and gently walked us forward to the next step at just the right times. She was patient and compassionate. Having my baby home, with me, with us and our family was important. Having her there with us the whole time (not going into the back room) and somewhere familiar and safe was comforting and critical. I felt safe to weep, to ball, to sniffle and wipe my nose, to let tears drop on Emily, to keep kissing her incessantly and telling her how much I loved her. And that everything was going to be ok. In her final moments, I told her my grandma and my previous dogs would be waiting to welcome her and that all her pain would be gone. I could say those things and be in that moment without judgment and with full support. Daniel was there and we could support each other through this difficult moment. Bodi was able to see what was happening that he could better deal with losing her too. I didn’t think having her sedated first would be a big deal or even realize the impact of it in the process. But it was so important. Emily was calm and comfortable during her last moments. The sedation injection was super quick, painless and Emily didn’t even notice it. She gradually just drifted off to sleep, giving her tired little body the permission it needed. She looked and felt peaceful. We kept talking to her, petting her, hugging and kissing her, telling her how much we loved her and that we were right here for her. There were no more spurts of erratic heart beats or trembling or her trying to be stoic. There was peace. Though I was still a huge ball of really gross ugly mess, there was peace because she was at peace. But she was still alive and she was comfortable. That made me feel good that her last moments weren’t fearful or in pain. And being she was already in a deep sleep from the sedation, it would help make the final injection go smoothly. Dr. Becky let us know she was ready and if it was OK, that she would administer the last shot to help her find her final peace and gain her wings. I don’t know the exact words she used, but they were the right words at that moment. They were gentle and kind and helpful. It was still excruciating and I felt like my heart had been clawed out by hand and shredded one piece at a time because I was losing my baby girl, but somehow, she guided us perfectly through this storm. We were able to walk to the vehicle and give final hugs and kisses to Emily and we were reassured she was in good hands and that she would take special care of her. I knew it and trusted that even though I hadn’t met Dr. Becky before. I didn’t need to – her love and compassion came through in everything she did to help us with Emily. She was authentic and genuine and I felt safe and more importantly, I knew Emily was safe in her hands. Dr. Becky gave us each a hug and said how sorry she was before leaving us. As I write this now, it dawns on me that I feel wonderful that I’ve referred Blue Sky Pet to my clients and that they have raved about how wonderful they are to work with. I can attest first hand now and will continue to let others know of their resources when they too need to say goodbye. Pets Remembered Cremation Services became important to me during the planning moments. I didn’t think it would. I didn’t have my last dog’s remains and didn’t feel regret about it. So, why would I need hers. It’s not really her and she would be gone anyway. It’s her memory, her soul and her energy that I will hold onto. Well, when the time came, I wanted her back. And I didn’t want her mailed back to me in two to three weeks. And I didn’t want to be without her. I wanted her home. I wanted her to come to our new home. I wanted her with her pack. I’ve known owners, Skip & Carol, as business colleagues and great down to Earth people over the years. And referred many of my clients to them because of their special and unique way of helping people through an excruciating time. I know how much they help and how much easier they make such a difficult moment. I knew that’s where Emily needed to go. I knew she would be in good hands. And I knew Blue Sky Pet worked with them, so I didn’t have to figure out or plan out any additional details, especially in an already stressful and emotional time. They have an alignment and a process already in place that makes it seamless as their client. Emily declined relatively quickly in the last couple weeks, and most definitely in the last couple days she was with us. 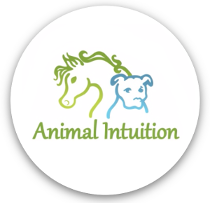 In those days, I looked for someone like me – like Animal Intuition – that could help me. Validate my feelings and confirm Emily was ready for help even though I knew the answer. To Support me. Tell me that it’s OK no matter how I’m feeling. To send me a message from her, even though I was connecting with her. I found that self validation wasn’t quite as comforting. I tried to remind myself of some of the thing I shared with my clients; that every journey is different, everyone grieves differently, that you will know when the time is right, that this moment and having to go through losing a pet is all worth it. I was angered at myself for how stupid I sounded even though everything I said was authentic and coming right from my heart. It didn’t’ matter. It didn’t change that Emily was leaving…or Emily was gone. But I still wanted it. I almost reached out to another animal communicator, but I didn’t – maybe I still will. But in reality, we’ve talked and connected. I know in my heart that it all played out the way it was supposed to. I know she knows I – we – love every single piece of her more than words can describe. I know. And I have the ability to connect with her too. But I’m hurting right now and right now I just may need something more than I can offer myself even though it’s something many of my clients need and want as they go through losing their animal companion. I want the pain to leave, I want to connect with Emily, I want compassion and understanding and support from someone that understands, that’s compassionate and that loves animals as their own family just like I do. In reflection, it brings light to what I do. I know a huge part of my calling is to help people and their animal companions during hospice and navigating through losing their love ones. I know it and feel it. I am strong and able to endure the pain as I know my work brings relief, comfort and support. I already knew this before Emily’s passing but it’s helped me realize how important this is as I go through it myself. I was giving her massages and healing treatments already her whole journey with me, and it was an honor to help her in that way too. She loved them and participated in them – pushing and rolling, stretching and baring down. Her sessions were far more informal, but even more rewarding. We were at home, comfortable and I was her momma. There’s nothing better than love, healing and support from your mom. And even though these massages and healing sessions were for her, she dished out love and healing right back. It was magical. I could see the difference it made for her. She calmed, the pain eased, she relaxed, slept, pushed into me, bared down, and showed me where she needed healing. She would sigh and yawn but more telling, she would look me in the eye and speak to me in our language. Of love and our souls connected. She was one in a million. I love her soooo much . She let me know what she needed and how much she loved me. I am certain that Emily gave me more than I could ever give her even with loving her so fully. She had a way like no other, of loving, accepting, wanting and getting just so she could give back. That’s a pittie for you! In the end I know our journey provided stability, compassion, love and a whole bunch of other wonderful things. But it also meant leaving. I knew this day would come. I think we have to bury it away until it’s unavoidable or we would never live fully. Emily’s first day home. Those soulful eyes. Emily was an amazing. She was stoic, resilient, tolerant, sassy, funny, social, loving and her heart so much bigger than what fit into her compact body. She was truly an Earth angel, even showing through her white markings – what looked like a pair of wings that spanned across her chest. How fitting for her. I’m not sure the right words to honor her in a complete way that would express every bit of wonderfulness that she exuded. But I will try. The underdog of under dogs being black and a pit pull, though she never saw herself that way. She was resilient, full of love and determination. She came to me almost six years ago as a foster. 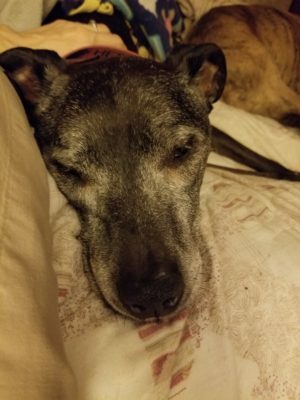 I primarily fostered “bully” breeds, she needed knee surgery and I told the rescue that if a dog is in my foster care that I would help with recovery for free; massage, range of motion exercises, and other healing work that she may need. So, I picked up Emily from the vet on June 13, 2012 to start her new chapter in life. Why I remember the date, I don’t know, but I do. I’m not good with dates and typically don’t remember them. She was beautiful and soulful, even while in a lot of pain and still groggy from anesthesia. 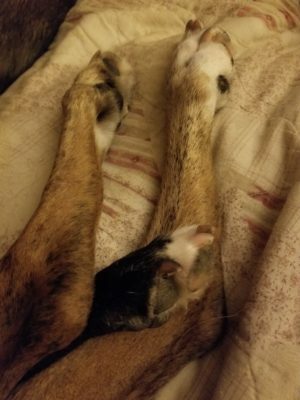 Her little leg shaved and atrophied from not using it and her body shaking. I got her as comfortable as possible, sat down next to her and did a little Reiki. She rested her head on my leg as if to say thank you. We had a little chat about what life will look like now that she’s with me. That I’d help her recover, how I was there to support her and that my house was her house for as long as she needed, that I would love her, that she was safe and that I would help her find the perfect family. Once she was strong enough and her leg healed she was integrated with my other dog, Bodi and my two cats. She did fantastic and was an easy transition. She loved them just as she already loved me. And in her mind, what could be better than more options for snuggling? She loved to snuggle. A typical pittie trait. I called her the awkward snuggler because she would come up to me so intently, wedge herself next to me as close as possible and then push…push hard and then swing her head up and down as if she was trying to burrow into me. Then she’s settle in, making sure she was touching me and I touching her. 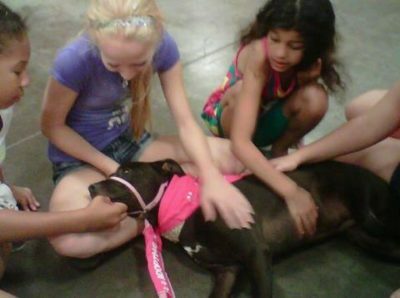 Emily soaking in the attention from some kids at an adoption event. 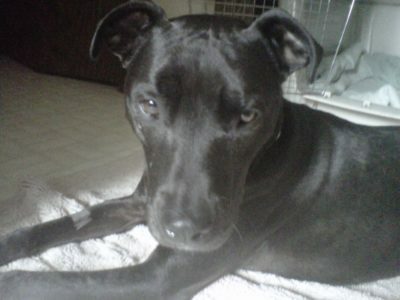 With time and work, she healed and was ready for adoption through Wags & Whiskers Animal Rescue. We went to adoption events, I plugged her on my fan page and doused my personal page with pictures, cute things she did, highlighted how well behaved she was and all the commands she knew. 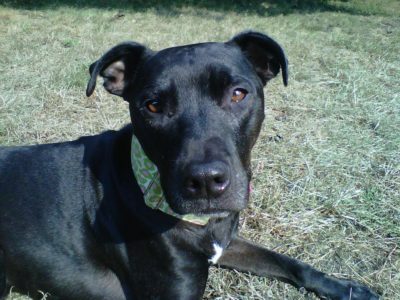 She was a dog, cat and kid friend, well-behaved pittie – something a lot of adopters look for in a dog. 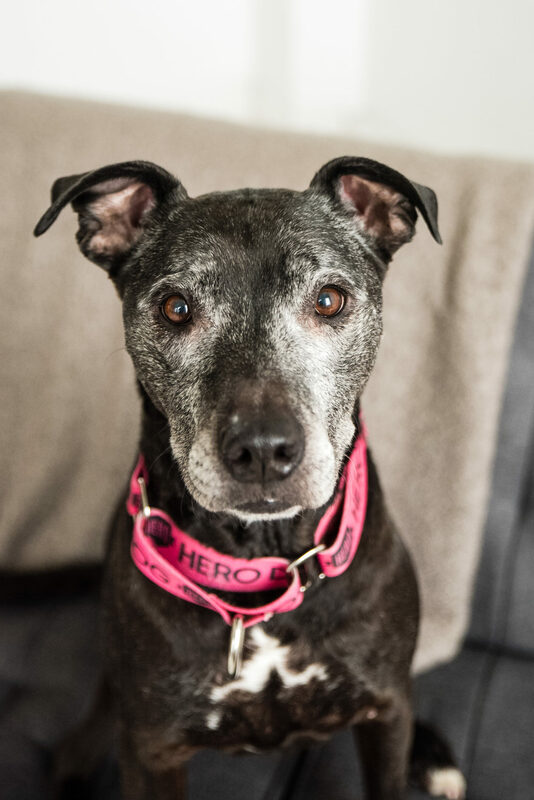 For a black pit bull, Emily got a lot of interest and many applications, but never the right fit. Everyone loved Emily that met her. 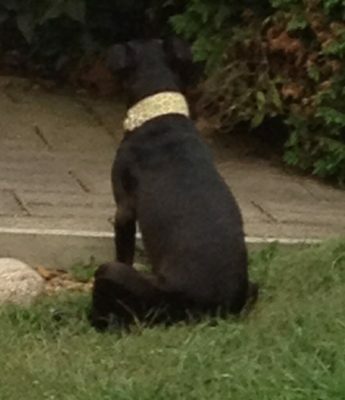 As ‘invisible’ as a black pit bull is in our society, Emily always found a way to be quietly noticed. She was polite and quiet, but people were always drawn to her and noticed her. I wanted nothing more than to find her the perfect family. I was dedicated and driven, knowing one of my purposes was to help her and then when our journey found her a home, I would help the next dog in need. Months passed and Emily wasn’t adopted. I didn’t mind, I loved her so much and she fit in so well with the family. I reminded her that she could stay as long as she needed. Meanwhile I started fostering other dogs. My house was set up for it, as was my heart and I wanted to help more dogs. Emily & Bodi welcomed them to our home; big and little, a lot of bullies and few scruffies, temporary and dedicated foster dogs came and went. Emily stayed. It was almost ten months after getting her that what seemed to be the perfect application came in for Emily. They had bully experience, used positive training techniques and another well mannered middle aged male bully breed dog. Before for I could contact them Casey, a friend and current board member of the rescue called me. To talk about Emily. To tell me what she saw in the months of us being together. That she was home. We talked for hours, I told her I was dedicated to finding Emily the right home, that I wanted to keep fostering, that I wasn’t in the best financial position to take on another dog (I was only 2 years into launching my business full time and still operating in the red), and that this family sounded perfect. We talked some more. She shared with me what she saw – telling me of all the things Emily and I have done and how much Emily loved me and how she fit perfectly into my family. She said sleep on it before you call the applicants. So we did. Everyone snuggled up in bed and we slept on it. I dreamed of Emily that night and woke up knowing she was indeed home. This was the first of many lessons Emily taught me about things not always going as planned and not always following logic. It was illogical and timing wasn’t right and I could think of a hundred reasons why to justify that she not stay, but I didn’t want to – I wanted her here and she wanted to be here. Home. With me for the rest of her days. She had been bounced around, starting life out in a shelter, only to return as a stray a year or so later because she was abandon. Brought up to Minnesota and into rescue, eventually landing in a foster-to-adopt home for a couple years. They never adopted her and when she needed medical care, they weren’t able to provide her with the care she needed so she circulated back into the foster pool. That’s when she came to me. She decided long before I would let the walls of logic down enough to see what our hearts needed. Each other. Being Emily was so social and loved people, she turned into a great side-kick for me during training events, speaking engagements and seminars. Not only was she my awesome little helper, she was a great ambassador for the pit bull and bully breeds, something else I’m passionate about. Emily got to visit Edina High School and teach students about loving a pit bull while I shared with them about non-traditional jobs with animals. She was my demo dog at many events, help me show people about massage, Raindrop Techniques and other healing. She was my girl during Animal Communication classes. She worked her way around the students, giving ample time for snuggles and of course an opportunist if anyone wanted to share food with her. Emily would help them feel comfortable, open up and explore their intuition in a safe environment. Miss Emily in her favorite chair. At home, she had her favorite spots and favorite things to do. “Her chair” in the living room where she could look out at the world, soak up the sun and jump into action should a rabbit or squirrel dare enter the yard. The days I worked from home, I’d hear her little paw-steps click up the stairs and come around my desk. She’d push her head under my arm and up onto my lap half her body would be. Face to face, really nose to nose, sooo close…staring intently at me. This was her thing. We coined her a “close talker”. If she wanted something or wanted to give something, she would get as close as possible and stare. Occasionally, she would gently give me a small kiss on my nose. We would play the guessing game. I would go through a series of questions and ask her what she wanted. “Do you want a drink of water? Do you want to go outside, a walk, to go to bed…”. She would wait, sometimes giving me an excited paw slap until I got it right, then she’d jump away, spin in a circle and head to the door. “Finally” I got it right and now her message was “come on, I’ll show you the way…” and off we went. Sunbathing, walks, people, snuggling, being a part of things, eating, chewing were all her top on her list. Emily was smart, enthusiastic and she loved to please. We would play games and work on commands. She always worked hard and had great manners. She would sit and be excited and reposition her sit as if to say, “don’t you see me here, I’m doing exactly as you want” all while keeping eye contact and focus. Kennel – she’d run in, spin around, and look for recognition. She loved getting new toys and would dance and spin and play with them… then destroy them. Chewing them up. Emily could polish off a large foot long bully stick in 15 minutes. Though camping was a newer thing to her, she loved walking about the campground. She’d lean in for pets or roll over for belly up for rubs when others stopped to meet her. When we’d turn and head back for the camper, she’d sit down and let me know she wanted to stay outside and with everyone else. Because she’s social and a people dog. Convincing this strong body and strong minded 50# ball of love to get inside sometimes took some effort….err…usually a tasty treat would do the trick. She loved to toodle in the backyard, sniffing and looking for rabbit pellets or other treasures. She would stalk the rabbits for hours if I let her, laying and waiting and hoping they would come out from under the shed. Emily was an avid hunter and would regularly get bunnies too. Not that I was a fan, but I learned early on just to let her have them. I tried at first to hurry outside and get them but it only made her eat faster and she would be done before I even got to her. So, the circle of life continued for those that dared to enter the yard while in her presence. She’d team up with Bodi too if it made sense, but was an independent girl, like her momma. Every once and a while she would want to play so she would sneak up to Bodi, hip check him, do what I called a pig spin (plant her front 2 paws and spin her back end around) to hip check him and take off running. Bodi always obliged and was excited to play and chase her. A lap or two around the yard and she’d give him “the paw”, ignoring him and back to sniffing and hunting she went. Our lives changed a few years back when Daniel came into the picture. A true dog lover through and through, so it was easy for Emily to pour on the charm and win him over. But she didn’t just win him over, she taught him a love like no other – a deep connection of fierce and true authentic soulful love. Of being present, and in her own unique and special way, she had him wrapped around her little paws. Of all our dogs (there were four), Emily could do no wrong. Except she would never come inside for Daniel. Other than that she was deemed perfect. In every way. Every ounce of him loved her and her him. She knew you could love more than one being fully and she did. Emily would often spoon with him at night while I stayed up working. Most often I was right there too, so she’d make sure that she was touching us both. She’d wake up and check in with me and then curl back up, tucked in and blissful. Sending out oodles of love. Daniel wanted to share some of his favorite moments too: Ode to Emily – What I will miss. 1) The eyes. Having fostered 200+ dogs, your eyes are magical. They have healing power. They cut to my soul. You walk up the ramp, (the smartest of the 4 to use it!) and quietly, calmly get about ¼ inch from my face and just look into my eyes. Just speak to me through those eyes. Looking out in the backyard to watch you sunning your gorgeous self. We make eye contact; you letting me know you are at peace. You are in your element. You are staying in the sun. 2) The click. The sound of your nails on the hardwood as you elegantly made your way around the house. I could always tell it was your paws by the gentle “click” making your way around the house. 3) The door. The excitement you exude for feeding time when you are outside. You jump up and down at our sliding glass door just waiting to pounce on your meal. 4) The Velcro. You are my Velcro. My State Farm Insurance – you are like a good neighbor and always there. I get up to go in the office and you follow. Bathroom are no off limits – you check on me. My Golden Retriever quickly became infatuated with Jenny and your admiration for my presence helped me feel at home. I know I am where I am suppose to be. 5) The bare down. Jenny taught me how you, like no other, could bare down if I ever tried to move you from a spot you wanted to be. You stiffen that little body and with all your pittie might try to hold the place you were in. 6) The covers. Your morning ritual that I could never fathom how you knew what time it was. You stroll up the ramp get between Jenny and I looking at us; telling us what you needed with your eyes. Us to move the covers so you could go under the covers and lay between us. How you are able to breathe is beyond me. It is unique, it is you, it is Emily. A pittie spooning is like no other and you are the queen of the snuggle. Waking up to wonder what pictures Jenny captured of you spooning me! 7) The recall. “Who me??? ?” How you conveniently forget your name whenever I called for you. Hearing your mom say “Who me?? No, the other Emily” You are my little princess and could do no wrong in my eyes. It only made our relationship stronger. 9) The cats. Seeing you be so so so gentle with our fur-baby cat critters. We are a family – all for one and one for all. 10) The smile. Your pittie smile is off the charts. You light up when guests arrive, children especially. Our social butterfly, our greeter, our everything. Emily, we are The Bade Bunch. We are not complete without you. Your ashes are going to be in the sun at our new home. We honor you, until we meet again Emily! Her cancer diagnosis was sudden, terminal and unexpected. By having the splenectomy done, it did give us almost five additional, wonderful months with Emily. Hopefully one day, I can look at that as a blessing – I guess I do now, but still don’t feel like it was enough time. We did our best to stay positive and cherish every second we could with her and our whole family. We wanted to do a bucket list, but really, there wasn’t much we weren’t already doing that she loved. Daniel came up with the idea of doing family pictures and getting some professional images of her while she still felt good. One of our favorite photographers that works in the rescue community and primarily with animals, KME Photography, was our first choice. She has special Sunset Sessions for seniors and those animals with incurable diagnosis’s like Emily. Literally, we loaded up everyone but the horse into the Rav4 and headed to her studio in North Minneapolis; four large dogs and two cats. The session was fun and light, making it memorable and relaxed. Kirsten was extremely patient and kind with our menagerie of pets tromping and sneaking about the studio. She captured some beautiful pictures and even wrote a special blog about our family. These moments are priceless. One of our friends in rescue, Barb, sponsored a care package from the Live Like Roo Foundation upon finding out about Emily’s cancer diagnosis. It was so special that someone else thought about my baby girl, sent her something just for her and that there’s wonderful organizations out there to support those living with cancer. We got some fun videos of her opening her package and playing with her new toys. She also sponsored another from Wally’s Smile. She enjoyed them both so much and the blankets from these gifts became her favorite to snuggle up in and be covered up. Emily loved to be covered, even at times it was warm. We treasure the videos where we can see the sparkle in her eye and animated gestures and tail wagging.